You'll be £30.00 closer to your next £10.00 credit when you purchase Rebuilding The Welsh Highland Railway. What's this? THE REVIVAL AND RESTORATION of the Welsh Highland Railway is one of the greatest heritage railway achievements of the 21st Century, yet its success followed more than one hundred years of failure. Supported by public loans, its first incarnation combined the moribund North Wales Narrow Gauge Railways, some of the abandoned works of the Portmadoc, Beddgelert & South Snowdon Railway and part of the horse-worked Croesor Tramway. Opened in 1923, it was closed in 1937 and the track was lifted in 1941. Serious talk of revival started in the 1960s but restoration did not start until 1997, with the neighbouring Ffestiniog Railway at the helm, supported by generous donors and benefactors, the Millennium Commission, the Welsh Government and teams of enthusiastic volunteers. Author Peter Johnson steers a course through the railway’s complicated pre-history before describing the events, including a court hearing, three public inquiries and a great deal of controversy, leading to the start of services between Caernarfon and Porthmadog in 2011. A postscript describes post-completion developments. Good maps and excellent photographs, definitely a good buy for any lover of the Welsh narrow gauge. Well produced with good maps and excellent photographs. Definitely one for any lover of the Welsh narrow gauge. The author of earlier histories of the Welsh Highland, Peter Johnson has now produced a volume primarily devoted to the remarkable modern reconstruction of the line, with which he was closely involved, and making extensive use of the colour photographic record of the project made by himself. Those fascinated by this extraordinary scheme will find it enhances their appreciation of the line. The author does an excellent job of detailing for even those that have never picked up a similar book before, so the words used are not just aimed at the railway connoisseur! It's a significant quality book too, with photo's aplenty throughout. One lovely book for any table in any home. A valuable historic record of an important railway project, as well as being a good read. The whole books is illustrated with a good collection of photographs with the author's privileged access to the work sites being put to good use. This is a book that deserves a place on the bookshelf of every FR and WHR supporter. 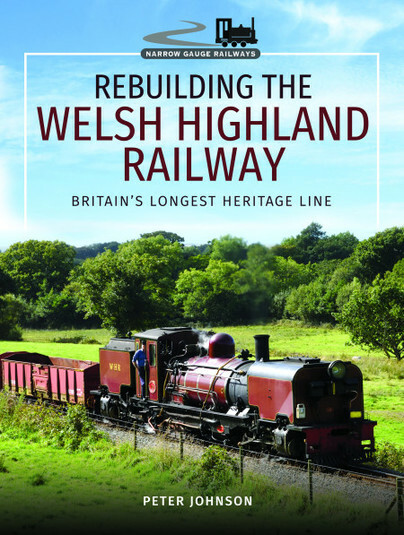 Peter Johnson, perhaps the best-known and most published expert on Britain's present-day narrow gauge railways, has really pushed the boat out this time with a massive tome on the revitalisation of the line from Porthmadog to Caernarfon. What Peter has provided is a thoroughly readable account of an extraordinary project; it is a perfect account for any passenger that has become intrigued after riding on the railway. Overall this is a well-researched account, illustrated by plentiful and high quality photos, and providing the level of detail that most readers will likely need. ★★★★★ Everything about this book represents the quality writing found in other publications by the same author. It is easy to understand and especial thought must have gone into reducing technical terms to an absolute minimum. I found myself hard pressed to put it down, wanting more with each page I read. Highly recommended for anyone remotely interested in railways but suitable for those whose interests center around heritage, engineering, both mechanical and civil. Now a retired local government officer, Peter Johnson was editor of the Ffestiniog Railway Societys quarterly magazine from 1974 until 2003 and a director of the society for eleven years. In 2003 he was appointed the Festiniog Railway Companys official photographer. Since his first book was published in 1984 he has added more than thirty titles to his list, specialising in Welsh and narrow gauge railways, but also including books on tramways and traveling post offices. In the last fifteen years he has researched original sources to write in-depth and readable histories on the Cambrian Railways, the Festiniog Railway, the Great Western narrow gauge, Shropshire & Montgomeryshire Light Railway, Snowdon Mountain Railway, traveling post offices and the Welsh Highland Railway.